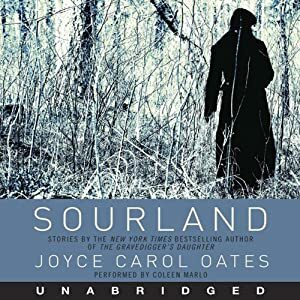 Most reviewers rave about Joyce Carol Oates' latest collection of stories, many of which are about recent widows who find themselves completely unprepared for the hostility of the world from which their husbands protected them. Coleen Marlo reads the unabridged audiobook with subtlety and energy, and there's no denying the power of these stories. Yet let me say how much I loathed nearly every minute of the 14 hours and 20 minutes it took to listen to this audiobook (the hardcopy is 384 pages), even as I admired its ability to so powerfully provoke emotion. Her women characters are nearly all naive, vulnerable and devoted wives. Her male characters are mostly troubled wolves, hateful and uncaring. The men hurt the women, and the narrators look on coldly. They may be interpreted as feminist, misogynist, or simply as Gothic drama and suspense. Maybe other readers will feel a greater sense of identification with Oates' women, but I don't see how that would work, since these central characters not only lack any control over their lives, but hardly control their own bodies. Yet these are highly educated women who hold positions of social privilege and power. On Oates's portrayal, it's hard to see how they are anything but foolish and pathetic.